I want to revisit my 2014 prediction “We’re all publishers”. Why? The core concepts behind the prediction are very much front and centre of my daily digital marketing life and have been all year. For a start; it makes sense to define what I mean by “publisher” in the first place. That’s especially true since I believe publishers and agencies are on a common evolutionary path and it’s that future I think about. I’m not suggesting that agencies will be installing ink and paper printing presses. The role of the agency is to solve problems for their clients. Clients need to improve their business. As a result agencies are (or should be) focused on those activates which improve businesses. Yes, we’re seeing the convergence of business intelligence (companies like Accenture and Logica), information intelligence (companies like IBM and Oracle) with digital marketing but let’s cover that later. For now, let’s assume that for the most of the time to improve clients’ businesses that agencies have to concentrate on how people (customers and potential customers) interact with them. This means earning more customers, making more money out of current customers, keeping customers happy, working on the brand to inherit all the perks that come with that and running cost effective and efficient campaigns. I can summarise the duties of agencies by saying they have to engage with audiences and earn money from that engagement. I use “audiences” carefully. I don’t mean old style segments that you might once have bought banner campaigns for. I mean individuals and communities. What’s the role of the publisher? Traditionally publishers turned scripts into books and put them on shelves. That’s no longer a service you need to outsource as an author. Today you can ebook publish or self-print with ease. Even outside the world of print publishing and in the glamourous worlds of video and game publication the process is becoming easier. 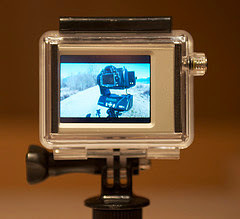 Run away successes like the GoPro have created a whole army of cameramen capable of amazing footage. As a result the modern publisher is offering alternative services. They may deploy editors to improve (or optimise) the text. They’ll certainly help market the book or video and bring their understanding of the market to the fore. I’ll summarise the roll of the modern publisher too. The modern publisher is about engaging with audiences and earning money from that engagement. Agencies and publishers both use “content” to help facilitate these goals. I use the word “content” carefully. People don’t call their Facebook accounts “content” or Game of Thrones streamed over their SkyGo app to their Xbox “content” and so the word barely seems appropriate. It’s good enough as a placeholder for this blog post though. Equally, neither agencies nor publishers exclusively use content to achieve their goals. Both parties look to use influencers, celebrities and events to help with their engagement. But what about brands? Brands are at the heart of this. Publishers might be promoting the work of their authors. Authors are brands. That’s why big name authors can sell their ebooks for £10 even though you can find great books online for less than £1. Brands are just as responsible for making (or allowing) great content. Brands must also go that additional step and facilitate and amplify the ever important audience engagement and monetisation. Interview an author with a book out recently and ask about the social media promotion work their publisher asked them to do. The conversation is an echo of one between an SEO agency asking their client to help promote content. Or an affiliate agency asking their client to make some noise around an event. I thought Michael Brito hit a few nails on the head in his Komfo interview How to transform your brand into a media company. The word “media” is just as overloaded as “content”. What’s the difference between a “media agency” and a design and build agency these days? Does anyone believe design and build agencies shrug their shoulders, build what they want and without respect to what is necessary to connect that build to an audience? Of course not. The creative and build process is a supporting tier to the media requirements. We’re halfway through the year and I still strongly feel that we’re all publishers. This is especially true if we look just a little ahead. Lastly, LinkDex invited me to a ThinkTank to talk about SEO for 2014. What did I say? I said we’re all publishers. Andrew Girdwood, DigitasLBi SEO For Brands In 2014 Videos from Linkdex on Vimeo.